People walk towards the Motiongate at the Dubai Parks and Resorts in Dubai, United Arab Emirates, March 30, 2017. DXB Entertainments' strategic review of its phase 2 expansion project to bring a 2.6 billion UAE dirham ($708 million) Six Flags theme park to Dubai involves "revisiting the assumptions that were made in the original business case just to ensure that going forward with the project will result in us continuing to deliver value to our shareholders", the theme park operator’s chief financial officer has said. Speaking on a call to analysts following its third quarter Q3 results, chief financial officer John Ireland said when asked if the Six Flags project was being delayed or pulled that "at the moment, obviously, the strategic review is ongoing... It would be premature for us to comment on the outcome." DXB Entertainments launched Dubai Parks and Resorts as its first phase in late 2016, comprising four theme parks built under phase one – Bollywood Parks Dubai, Legoland, Legoland Water Park and Motiongate. The firm announced the strategic review alongside publication of its third quarter results last week, which showed that the company reduced losses by 4.5 percent year-on-year to 271.4 million dirhams, despite an 11 percent fall in revenue to 102.6 million dirhams. Revenue declined despite an increase in visitor numbers because spend per capita has declined due to discounted ticketing schemes introduced last year in a bid to boost footfall. For the first nine months of 2018, visitor numbers increased by 33 percent to 1.96 million, but average spend per head dropped to 135 dirhams, from 179 dirhams per head in the same period last year. As a result, nine-month revenue of 392 million dirhams was marginally (1 percent) lower than the 395 million dirhams made last year, and losses continue to be considerably higher than revenues generated at the park. The company’s nine-month net loss shrank by 15 percent to 734 million dirhams, because the company managed to reduce operating expenses by 24 percent. 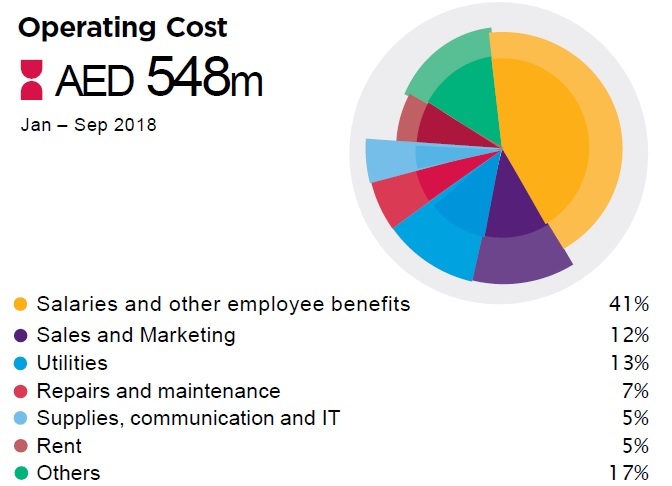 Ireland told analysts that a reduction in salary and employee expenses had been "a key driver of cost savings", but that these still account for over 41 percent of the company's cost base. Finance costs increased given that the company has fully drawn down the 4.2 billion dirham facility it received for phase one of the project. It also arranged a further 1.2 billion dirham convertible loan facility from majority shareholder Meraas in March. By the end of September, the company's accumulated losses to date stood at just under 2.5 billion dirhams. DXB Entertainments first unveiled plans for the Six Flags Dubai resort, its phase two expansion project featuring a 3.5 million square foot park with 27 rides, in July 2016. The company secured 1.9 billion dirhams from investors via a rights issue in 2016 to build the park, and a further 993 million dirhams in debt financing, although Ireland told investors on the recent results call that this facility remains undrawn. A spokesman for DXB Entertainments told Zawya by email on Wednesday that "all feasible options for Six Flags Dubai are being considered and the full results of the review, including recommendations regarding the scale of the project and timing, will be presented to the board before the end of the year". The park was due for completion by the end of next year, but Ireland told analysts "we have slowed down marginally on the project" while the review takes place. Ghantoot Road Contracting is main contractor on the project. It was not available for comment. DXB Entertainments' chief executive Mohamed Almulla told analysts on the call that its strategy for raising revenue involves targeting more international visitors (60 percent of park visitors are currently from the UAE) and pushing up prices in certain categories to increase yields. A single park tourist ticket will soon increase by 10 dirhams to 245 dirhams, while an annual pass for all parks will increase by 70 dirhams to 595 dirhams. "The price change is very marginal, with the largest increase targeting the annual passes, which are in high demand, so we feel comfortable with that approach," Al Mulla said. Ayub Ansari, a senior analyst with Bahrain-based investment bank SICO, said that given the mismatch between the park's revenues and its cost base, the most important task for management is getting more people into the park. "There's only one issue and that's footfall," Ansari told Zawya in a phone interview on Wednesday.